The Connoisseur, a Norman Rockwell painting , appeared on the cover of The Saturday Evening Post published January 13, 1962. This is another timeless favorite of Rockwell collectors, a classic for all the ages. This painting was Rockwell's 317th overall out of 322 total paintings that were published on the cover of the Saturday Evening Post. Rockwell's career with the Post, spanning 47 years, began with his first cover illustration, Boy With Baby Carriage in 1916 and continued through his last, Portrait of John F. Kennedy, in 1963. This was also the first cover for The Post in 1962. In 1962, there were two Norman Rockwell Saturday Evening Post covers published. The original oil on canvas mounted on board painting, 37.75 x 31.5 inches or 96 x 80 cm, is part of a private collection. on page 236 and color plate 24 of Norman Rockwell, A Definitive Catalogue by Laurie Norton Moffatt. Three studies are also reproduced in Norman Rockwell Catalogue on page 236. Pristine original copies of this magazine cover bring good prices on eBay, when it is available. And to think it only cost twenty cents originally! And it was mint condition then, too. This is one of the best well known Norman Rockwell paintings. 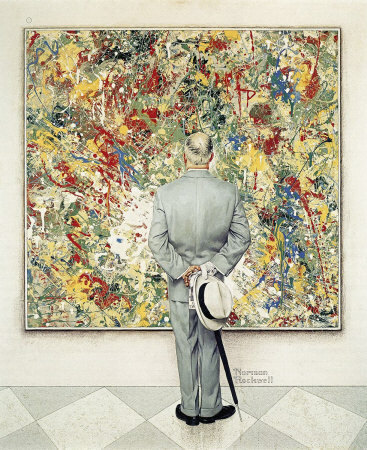 In this painting, Rockwell not only showed that he could paint abstract like Jackson Pollack, but that he could use that skill to tell a story also. The painting inside this painting, a familiar device Rockwell had used before in his stories, is actually a painting that Rockwell did in the Pollack style. He painted the dribbles and drabbles just to be included in this painting. The man shown appreciating the painting is portrayed as a typical art lover, and probably an art owner as well. The incongruity in the painting is that the art lover is standing too close to the painting to be able to see the whole composition. Maybe he is looking at some of the individual paint sprinkles. The painting is bound to look better from farther away than this fellow is standing. The Connoisseur was only one of 322 Norman Rockwell Saturday Evening Post covers; Here is the list of Norman Rockwell Saturday Evening Post cover illustrations. He is a dapper fellow, well dressed with suit, hat and gloves. He is holding a program from the exhibit he is viewing. He also carries an umbrella, maybe as protection if it starts raining paint sprinkles. Do You Have A Great Story, Opinion Or Contribution About The Connoisseur?